The distinctive approach the fly fishers at Fort Shockley bring to fly fishing is from the ground up. Each catch, whether it be trout, salmon, or salt water, starts at the tying bench. We feel that the workstation should enhance your fly tying, just as a fine vise, sharp scissors, ceramic bobbins, and hackle pliers, contribute to your pleasure and satisfaction. 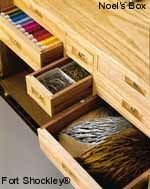 A fly tying area should provide organization and arms length access to the materials you use on a regular basis, less frequently used materials can be stored in another location. Your tools; bobbins, hackle pliers, scissors, whip finishers, bodkin needles, and vise should again be organized and stored at no more than arms length. 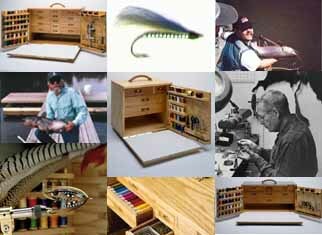 It is also extremely convenient to able to stow your fly tying area quickly and efficiently in such a manner that it is secure from unwanted "helpers". Your fly tying area should be at least as easy to sit down and tie a fly at as is to clean up. The last two items ultimately end up being the greatest contributors to your long term fly tying and fly fishing pleasure. This pursuit married with the skill of the craftsmen at Fort Shockley has created the workstations, and tying tools that you will find here.